Normally after the house is framed with the roof on and house wrap installed, you would install the windows and doors… Unfortunately for us the windows and doors were delayed, and then delayed again, and then again, and then they sent out only a partial order forgetting to send a window and all three of our doors, and so we had to wait some more. Frick (more on this later). 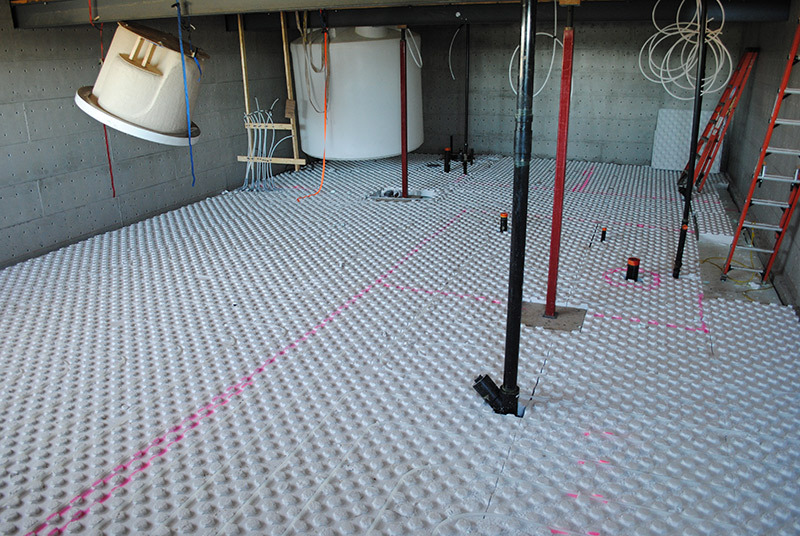 But rather than sitting and waiting for weeks for the windows to finally arrive, we decided to continue forward with the plumbing and electrical rough-in, as well as pouring the concrete floor for the basement. Seeing as we are in the countryside, where we see more deer than people, we do not have to worry about someone wandering into our construction site and stealing the copper wires (apparently this is actually a serious problem on construction sites – the building will be completely wired, and then some criminal cat burglar will come in the night and pull every wire out of the house, taking it to the scrap metal yard for cash). This stage is also really messy. However, one thing we did which was not standard, was the height of our light switches. 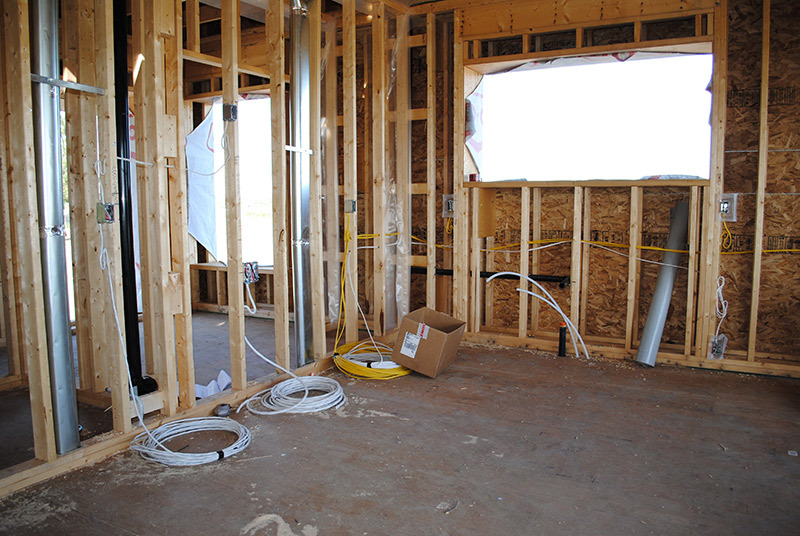 Light switches are usually positioned at 42″ from the finished floor. Although previously this had been 48″ in the old days due to wainscotting and chair rails. The 42″ height is accepted as the standard height, however there is one problem with this height: See photo. I hate this! It is almost always in the way of where you want to hang art. Maybe I’m just a little too OCD, but this is one of those things that really bugs me. Plus we have some nice art that we don’t want to have uglied up with the light switches beside them. 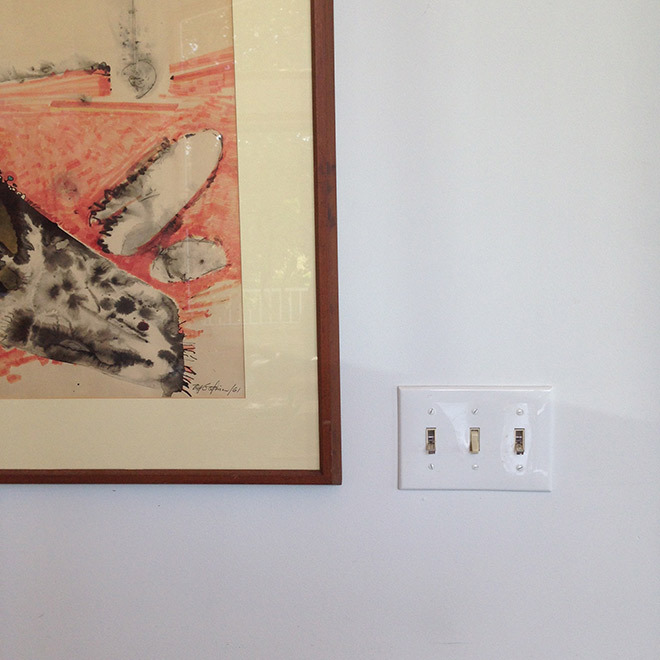 Last year we were touring a friend’s new house and we noticed that all of the light switches were just a tiny bit lower. He told us that he asked the switches to be set at wheelchair height, which is 36″ from the finished floor, thus not obstructing the placement of all of his pretty art. Genius! The light switches are still convenient enough to reach even if you are not in a wheelchair, they’re essentially at waist height, which if you are an especially lazy person you will enjoy even more as you don’t have to lift your arm nearly as high to turn on and off the lights. Win-win! 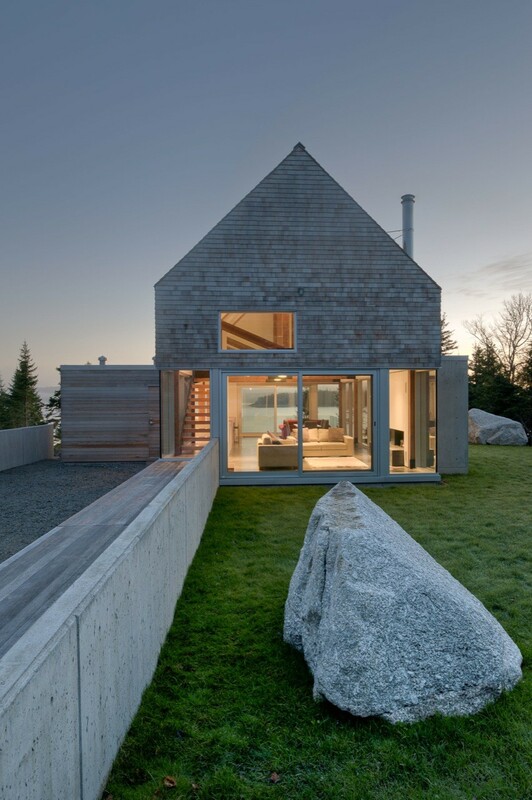 We had really debated about doing a house without overhangs, which when scouring design sites, we had seen a lot. 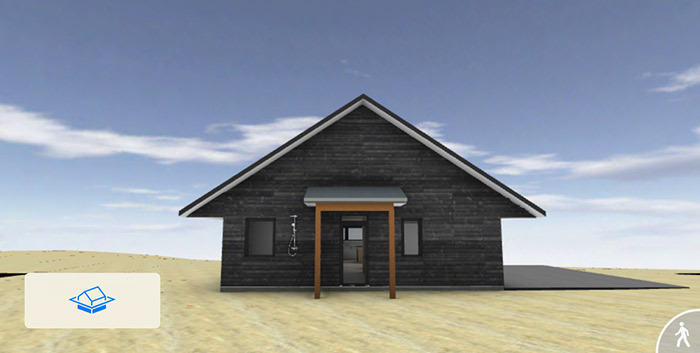 I really like the look of these types of vernacular houses, and we came very close to building something along these lines. However, we were talked out of it – or perhaps, talked into proper overhangs, by our engineering team, Integrated Design. 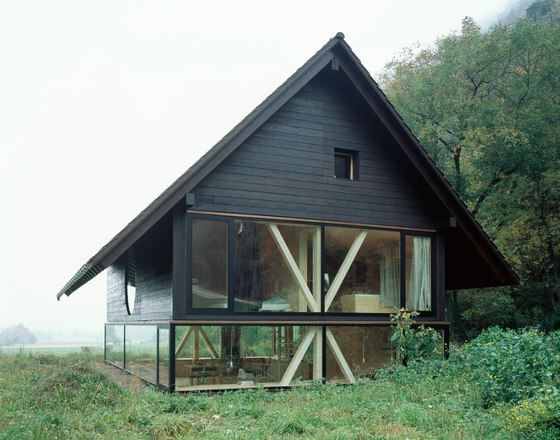 They were very adamantly against the “no overhang” aesthetic that we were drawn to. 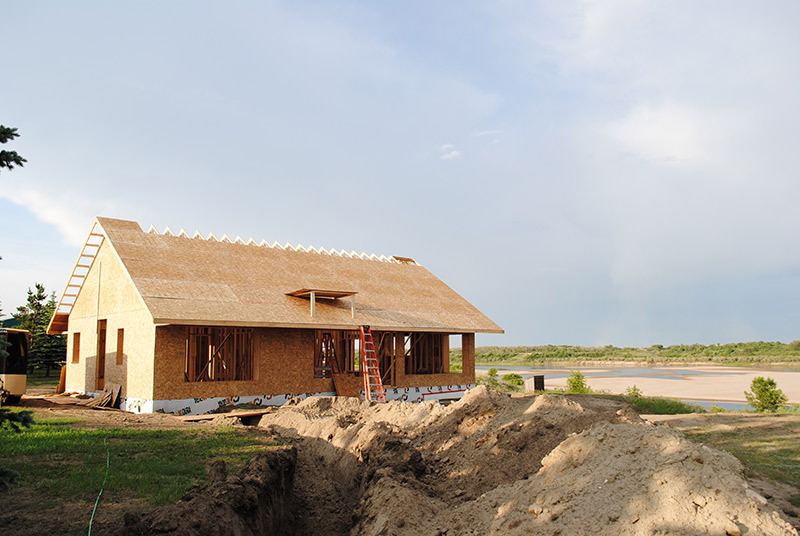 Granted they had some valid points including: adequate shading in the summer, protecting the siding and windows from rain and excessive moisture, and keeping water away from the foundation. Grudgingly I did some of my own research and dammit they were right. 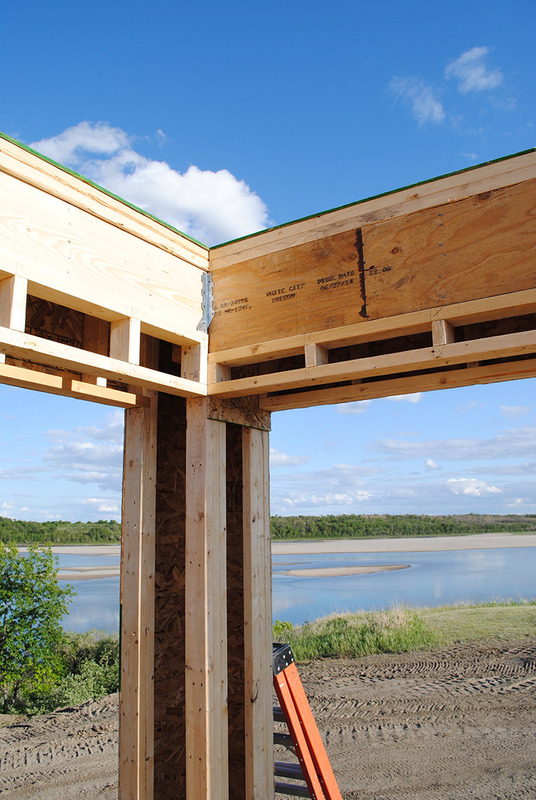 This article from Green Building Advisor shamed me for doubting the importance of overhangs. 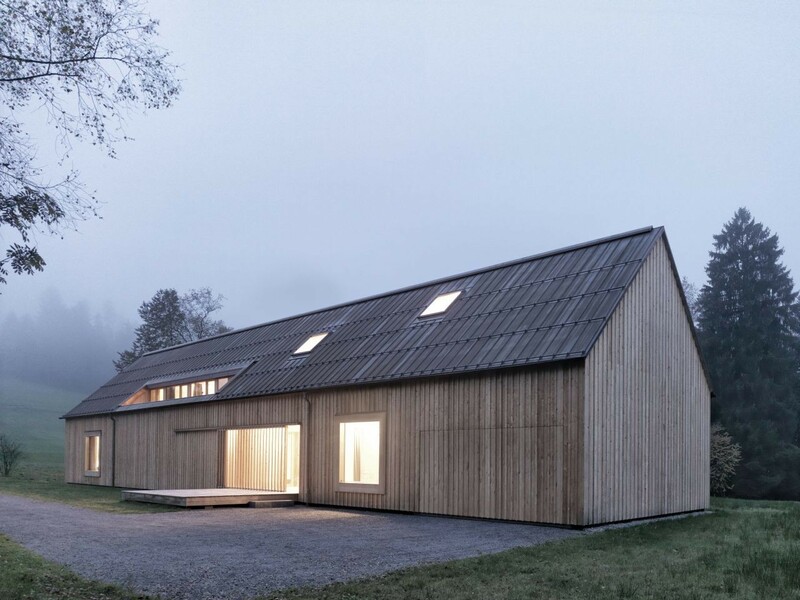 Although I was drawn to profiles of houses like those in the above photos – our most favourite house is called the “Stockily in Balsthal” by Pascal Flammel Arkitekten. After playing around with solar studies in the computer program and tracing the path of the sun with our GPS location we found that the optimal overhang width – that would give complete shading in the summer, ultimate solar gain in the winter, and still looking badass – was a 48″ overhang. 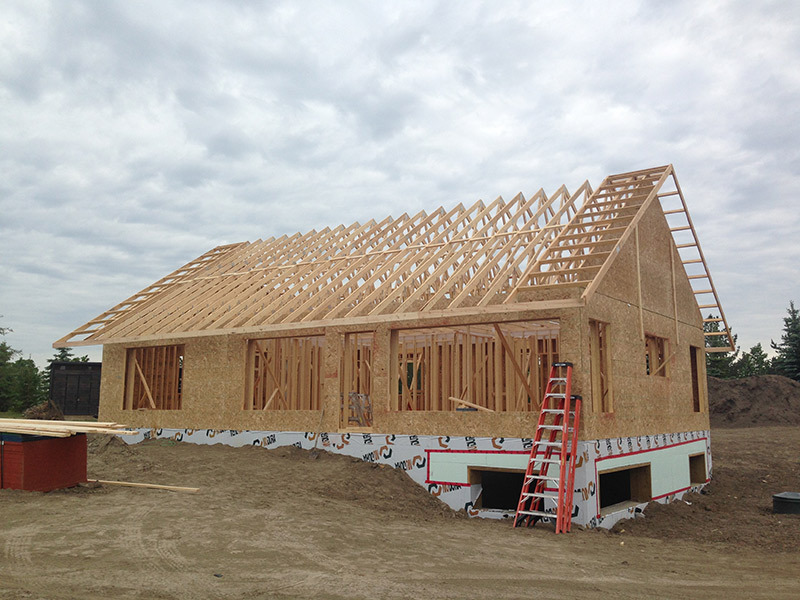 Most roofs in this part of the country are 12-20″ wide so 48″ is quite a statement. I loved that fact that it balanced the aesthetics with the practicality of overhangs. But I was not sure how this would really look until the guys got the rafters up and in place. At 38′ wide and nearly 20′ tall the rafter company had to send a special truck out to deliver them, which I took as a good sign that these were going to pretty be unique. 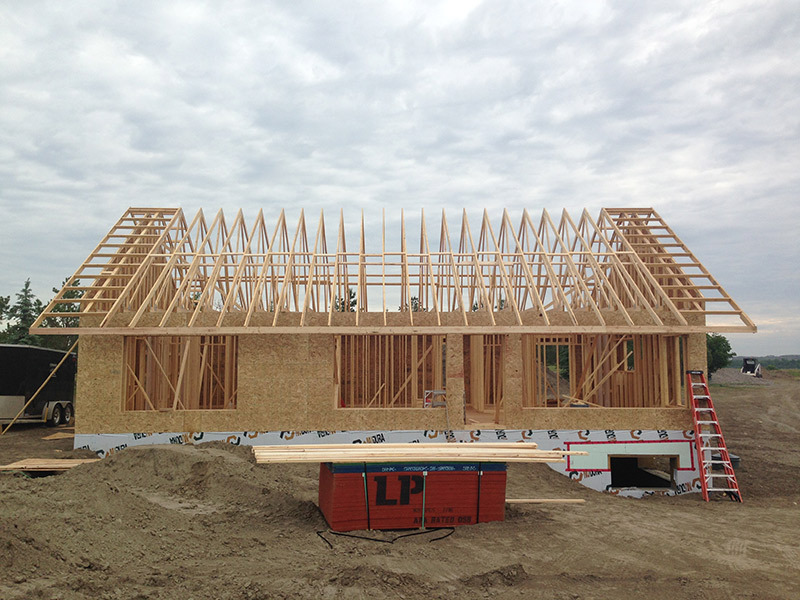 By the next day the interior walls were framed and roof was nearly completely sheathed. 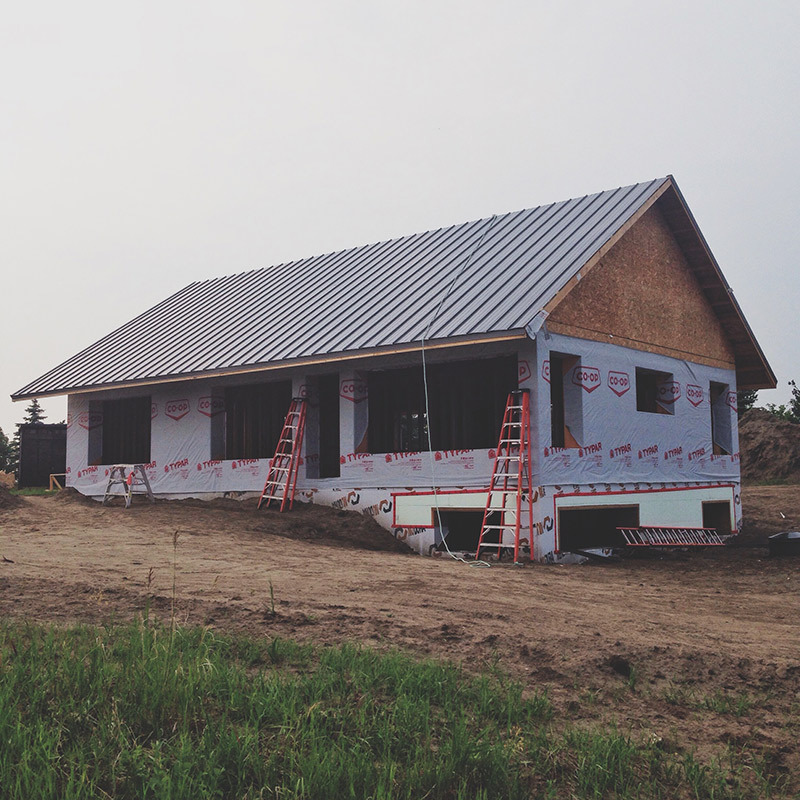 Two days later the standing seam metal roof was on. The house was looking pretty darn badass, I’d say. 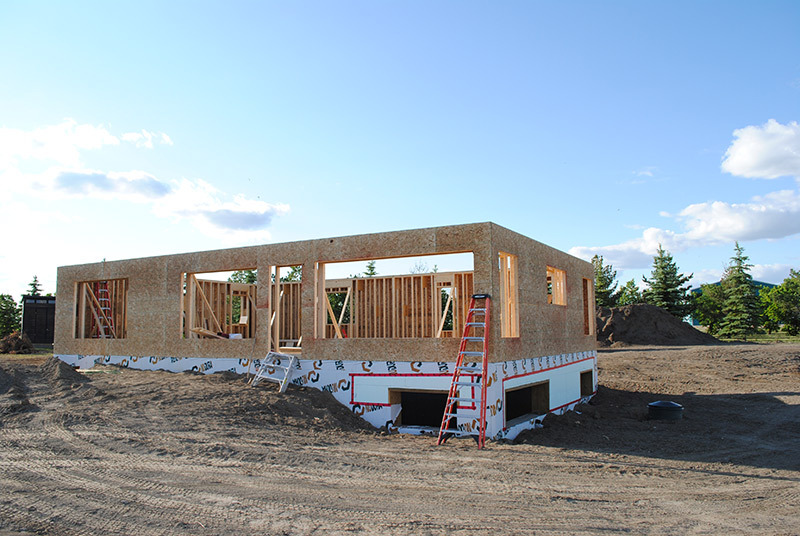 The day following the completion of the excavation, backfill, grading and dirt hauling, Taylor and Curtis with EcoSmart got to work framing the double-stud exterior walls. 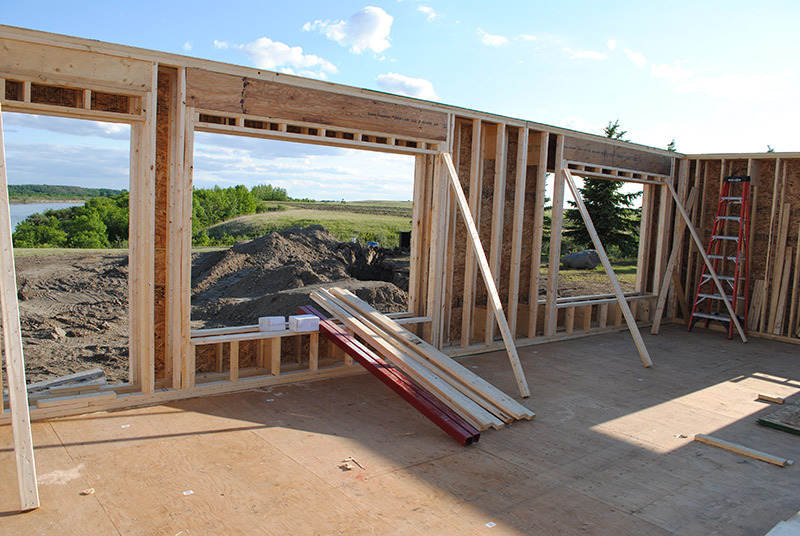 We had chosen to use the “deep wall system” originally developed by Rob Dumont, a local Saskatoon engineer who is widely recognized as one of the pioneers of super-insulated green building. He has been a major inspiration to the owner of EcoSmart Developments, Murray Guy. 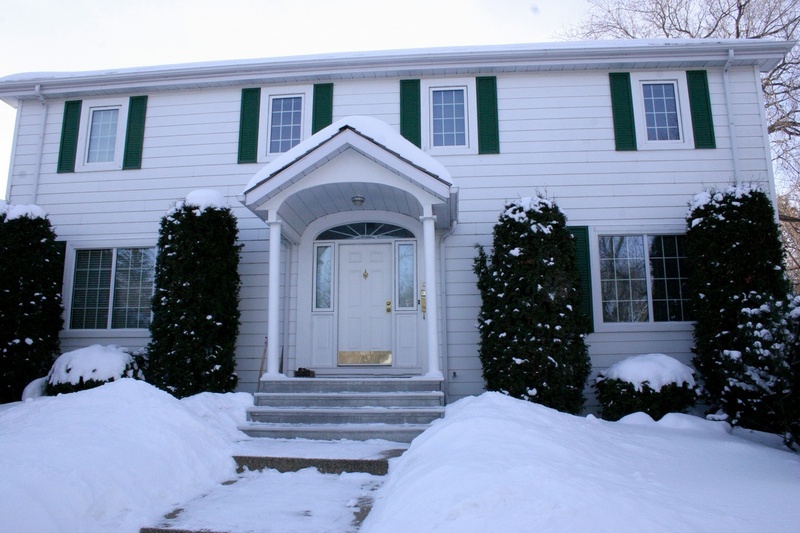 Rob Dumont had been one of primary engineers in creating the Saskatchewan Conservation House – which is one of the original homes that inspired the German Passivhaus movement. 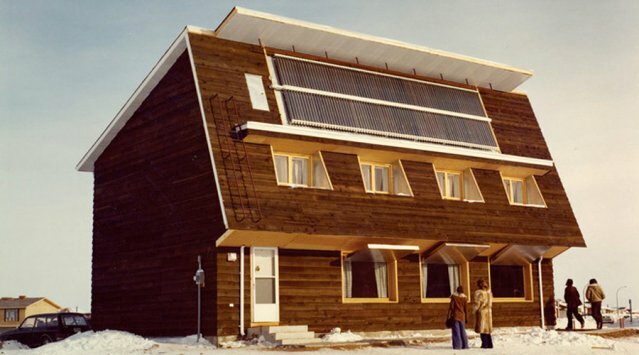 This is a fantastic article about Rob Dumont’s own home that he built in 1992 using his deep wall system (it was considered to be the most energy efficient house in the world at the time!). 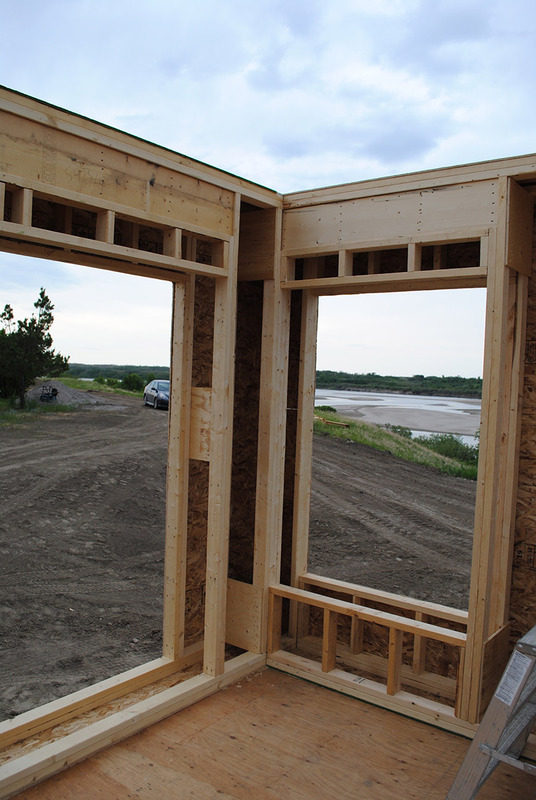 Rob Dumont developed this super-insulated wall system and Peter Amerongen from Edmonton AB has been perfecting it over the past few years, using it in the Riverdale NetZero and the Mill Creek NetZero homes, amongst others. 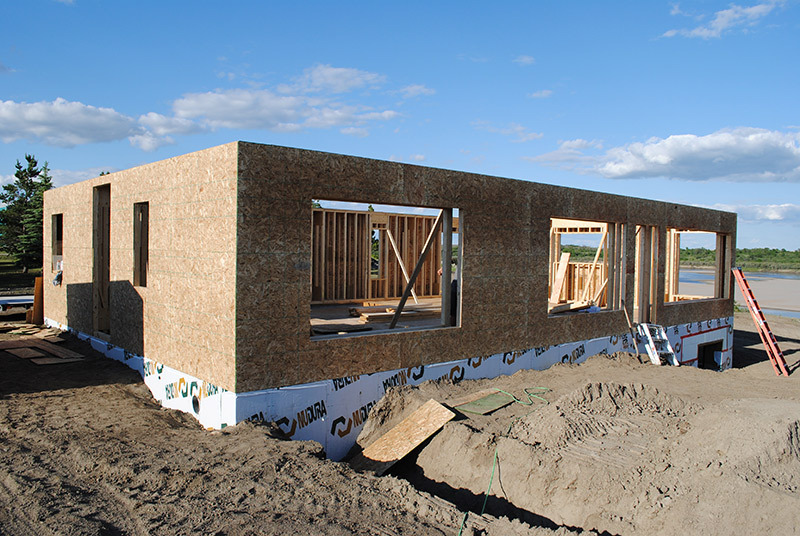 To my knowledge, no one since Rob Dumont himself, has built another home in Saskatchewan using this type of wall system. I’ve written about this wall system previously, but now we were going to see it come to life before our eyes. Taylor and Curtis had of course never built this type of wall before, but they had done extensive research and were very motivated about it. 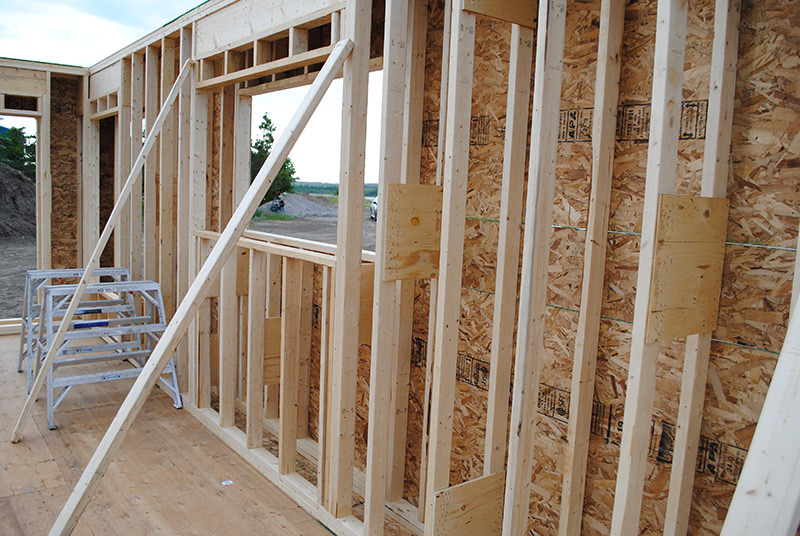 This wall system utilizes two 2×4 walls, spaced 16″ apart thereby creating an 8″ void between each 2×4 wall. 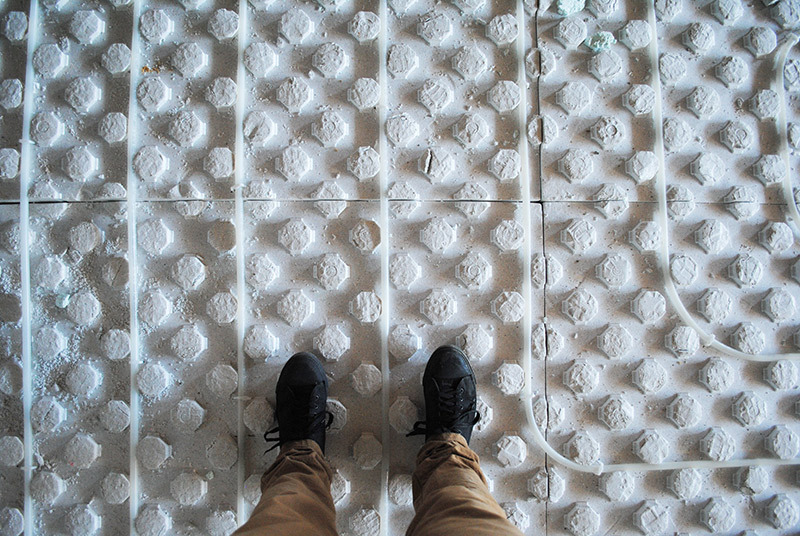 There is no need to offset the studs as the large void, which will be filled with dense-packed cellulose (recycled newspaper), has no thermal bridging whatsoever. 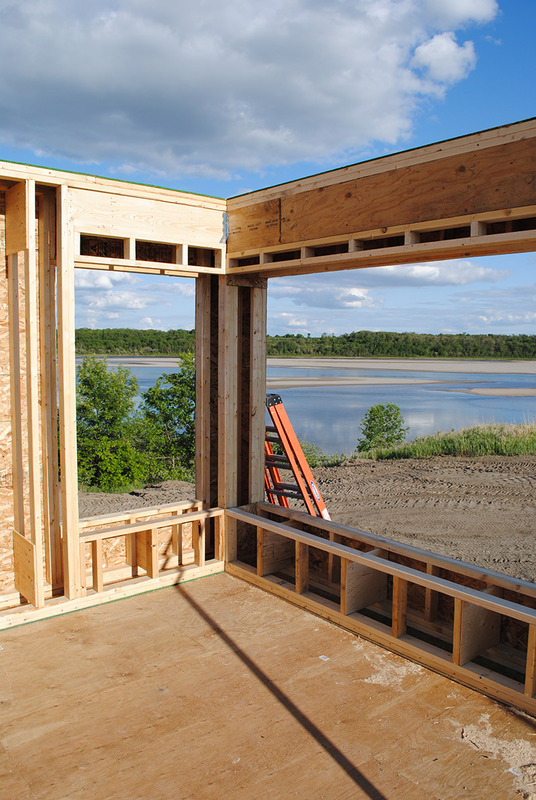 We elected to space the 2x4s at 16″ centers for both the interior and exterior walls. 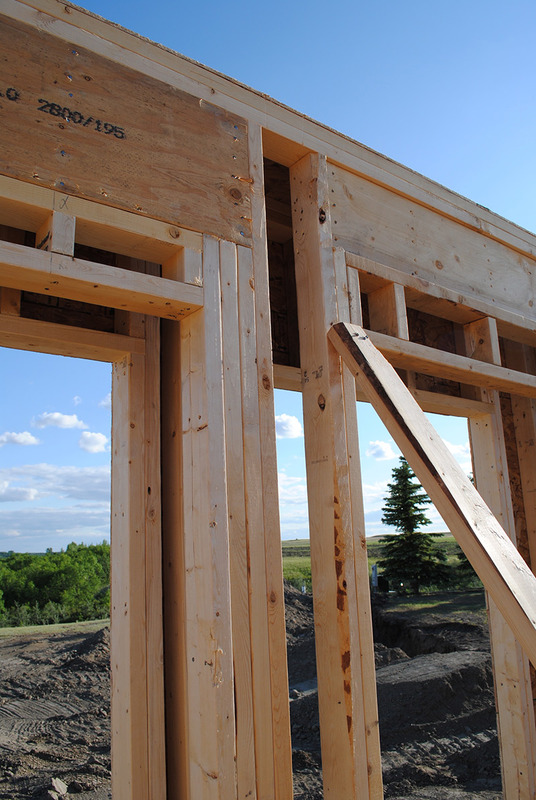 It is possible to space the non-loading bearing wall at 24″ centers, but when attaching the wood siding to the exterior wall (our non-load bearing wall) this might be a little more tricky. Of course this wall system takes a bit longer to construct then your typical stick-framed house, as each wall needs to be built twice. 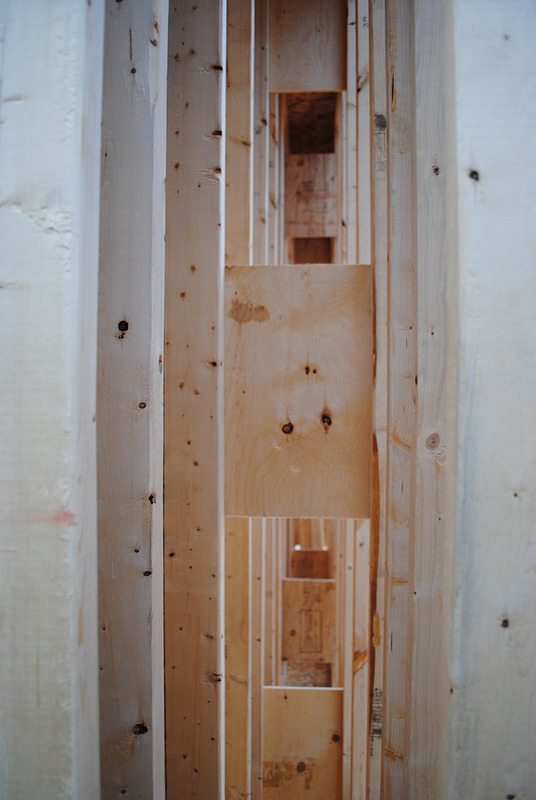 What the guys did was to lay the lumber one on top of the other to ensure that the spacing was appropriate. 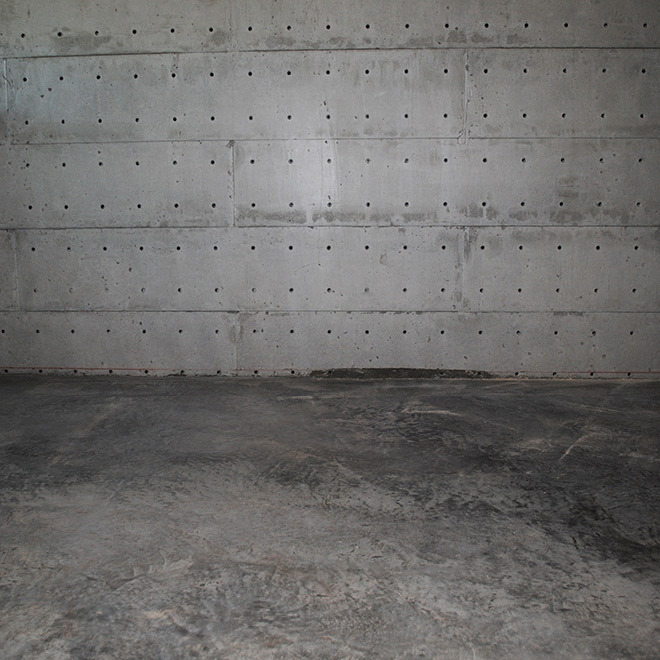 The studs were nailed together with a double bottom plate (we will be pouring 1.5″ of concrete for the main floor so you another bottom plate was needed in order to secure the drywall to it) and a double top plate. 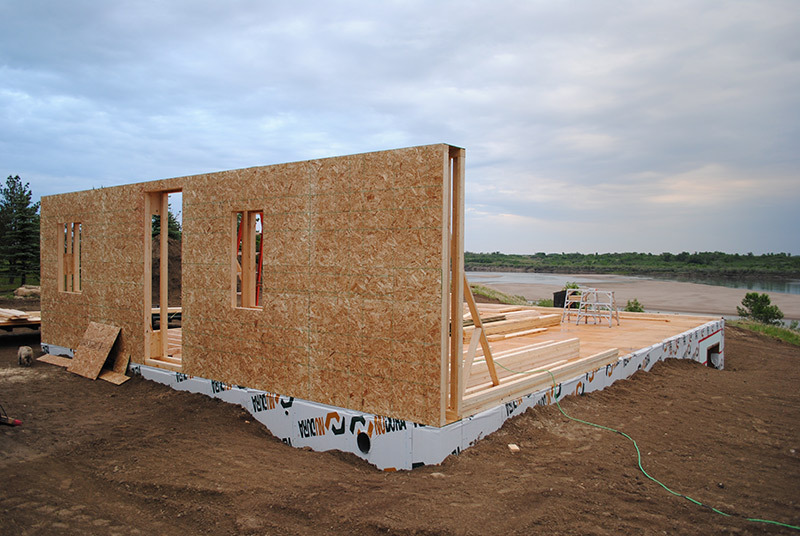 The two walls were then secured to a 16″ wide 3/8″ OSB header and footer and tipped up into place using wall jacks. 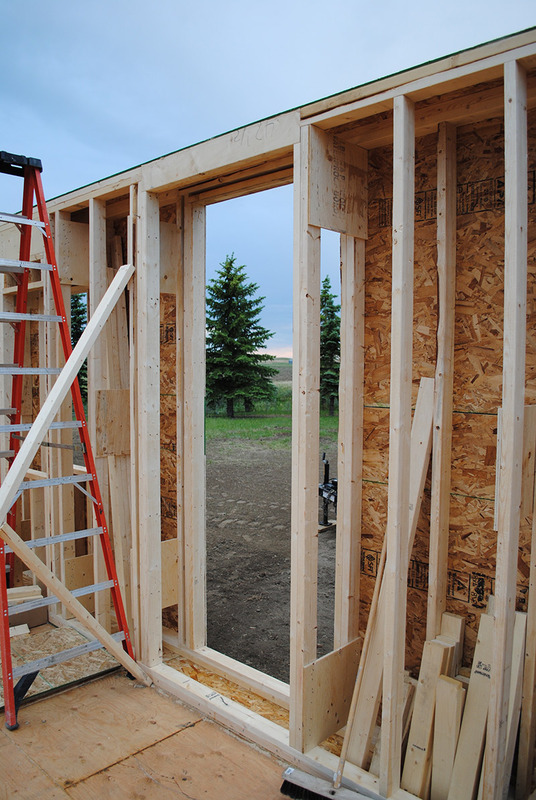 The walls were then glued and nailed into place and sheathed on the outside. 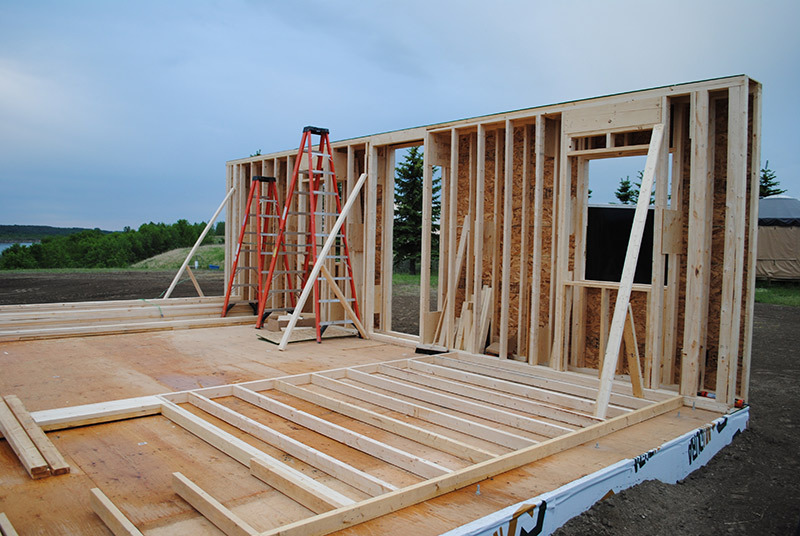 The first day they framed the west wall which is 30′ in length. Honestly, the excitement of seeing a wall could not be contained that day. 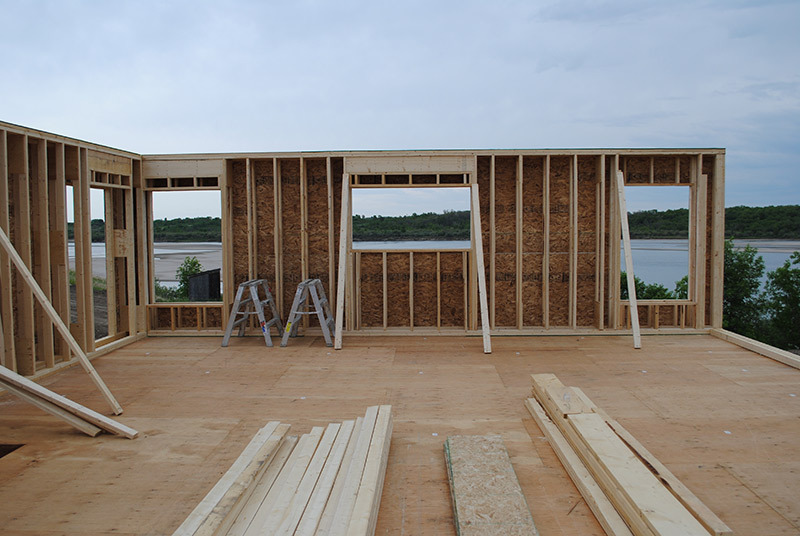 Day two they framed the north side which is a longer 48′ wall with minimal penetrations – one window in bedroom, one in the hall for ventilation and the back door. Day three was the west wall, again 30′, which included three large windows (energy efficient geeks will note that there is minimal benefit to large windows on east side and there is risk of overheating in the Spring and Fall) however these windows look onto an amazing river view that we had to enjoy. The windows will be glazed in a special coating to reduce heat gain (more on that later). 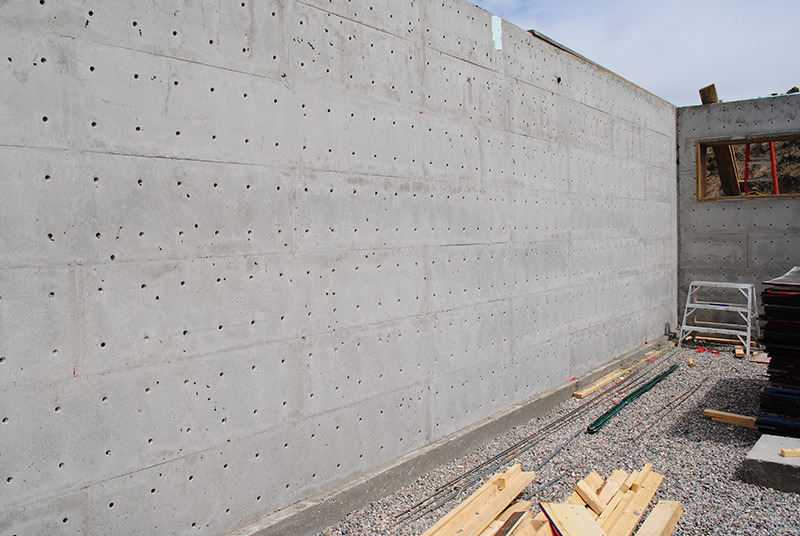 Day four they ambitiously completed our southern wall, our primary 48′ wall, with three MASSIVE windows – all of which are more then 10′ wide – and a patio door to the deck. 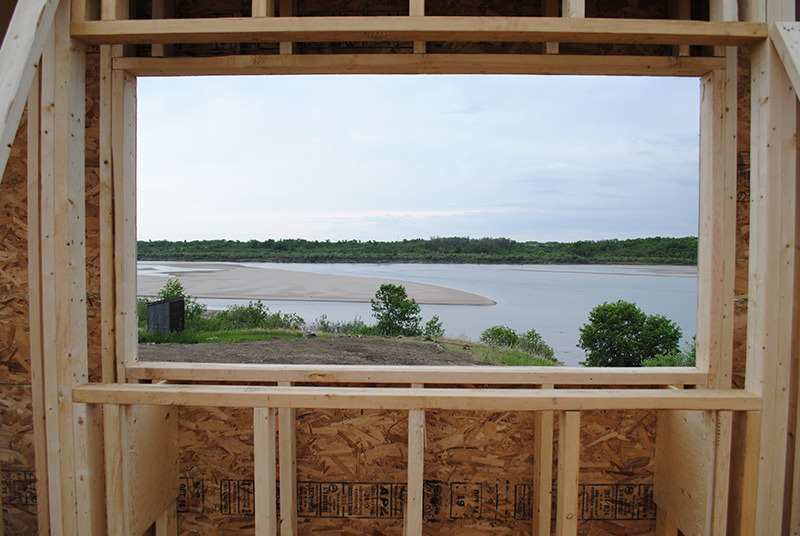 This side of the house looks onto a beautiful southern view across the river valley, but also will be a source of heat gains in the wintertime. 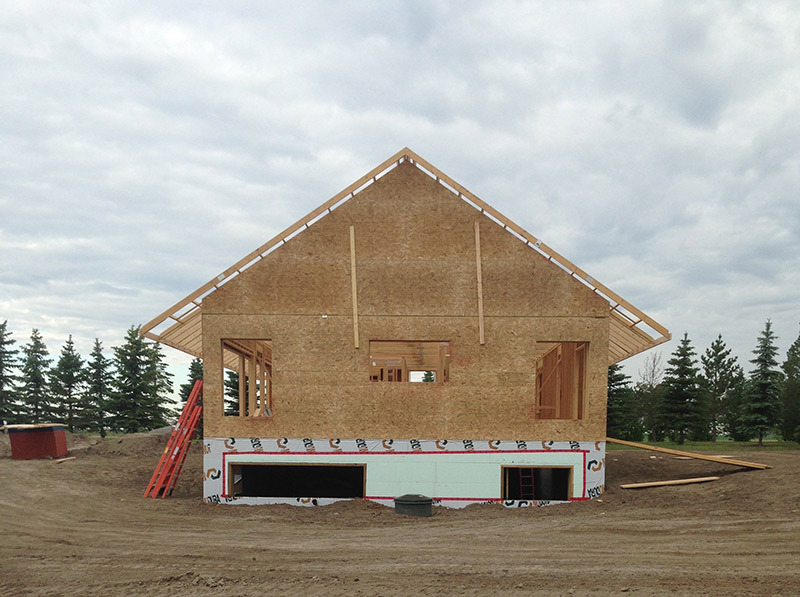 Next would come the interior walls and roof – and suddenly this was looking like a house! 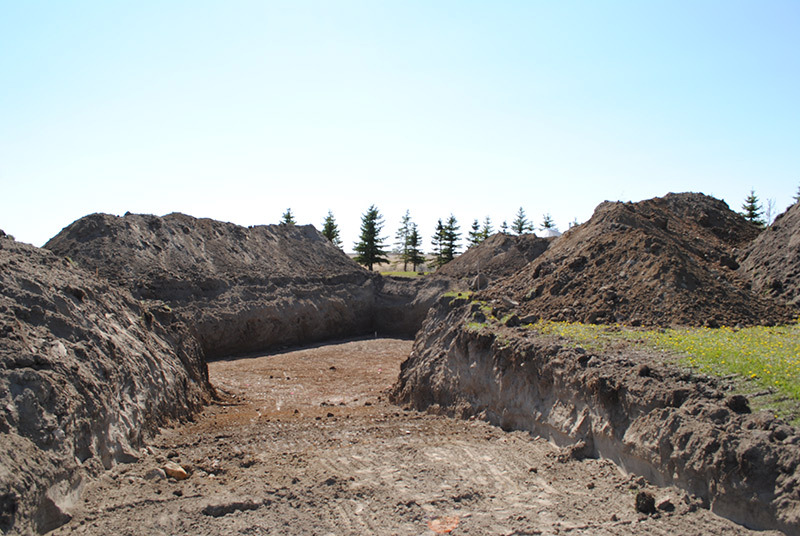 I had so much anxiety about the excavation of the basement and the ensuing gigantic piles of dirt. I honestly cannot tell you how much sleep was lost as a result. My mental health deteriorated and my drinking increased. 1. The majority of the dirt should have been moved on the day of basement excavation. 2. It had caused major issues and potential of massive cost overruns due to the septic system needing to be repositioned (yes this disaster was averted). 3. The cost of excavation that we got from Mr. A-hole was astronomical. The quotes I received from two other companies were very high as well, but less severe. Nonetheless we hadn’t budgeted for it at all – so it all just seemed terrible to me. I did seriously debate for awhile about how long it would take me and how much diesel it would cost to move the dirt with the 60″ bucket on my little tractor. 4. I was super worried about access of a septic pumper truck to the new septic tank placement (the original spot would have been fine but the new placement we had not made sure of this as it was decided after the foundation work had already started) as well as the water truck that would need to haul water in for us. It was impossible to get any idea of the spacing with so much dirt piled all around the house. 5. 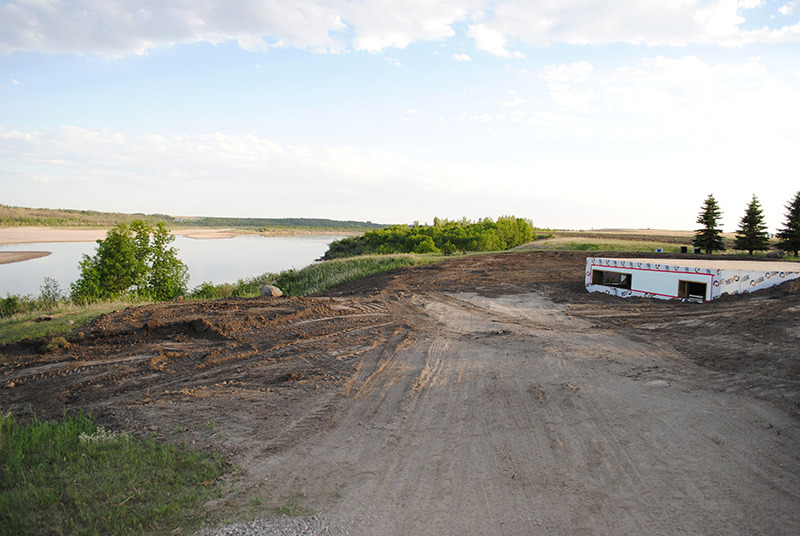 The dirt looked horribly ugly and completely blocked what used to be our pristine river view. Sigh. 6. And we still hadn’t confirmed anyone to actually do the work – there were estimates of anywhere from 10 hours to 24 hours of work to move the dirt. When you are paying upwards of $400/hour for all of the equipment, that is not reassuring. 7. 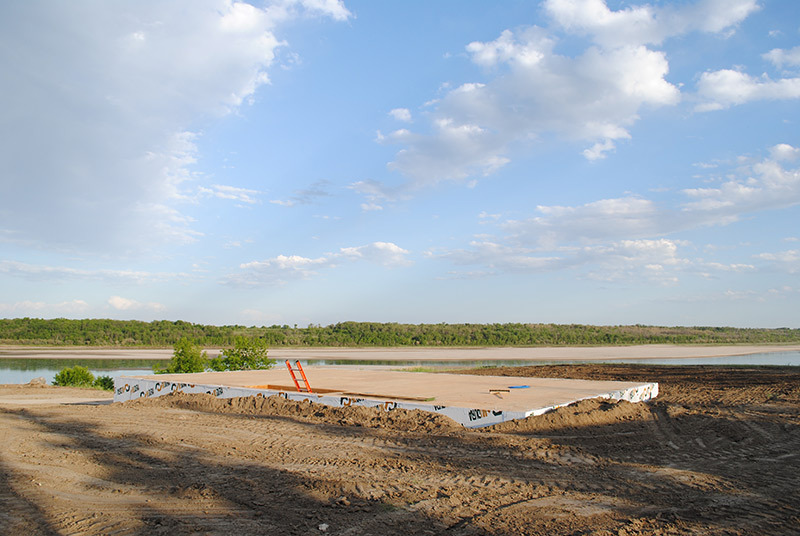 Framing could not begin until the dirt was moved and backfill complete. Meaning there could be huge delays if we could not get someone in quick. All and all, I was STRESSED. That is until I met Murray Perehudoff who owns M&L Backhoe Services. He was highly recommended from our builder. We explained to him the situation of being screwed by our former septic/backfill contractor and that we were in a bind. Murray was willing to come out the following day and take a look at the situation. I was super impressed (we ARE out of the way where we live). He checked it out and thought it would likely take one day of work! 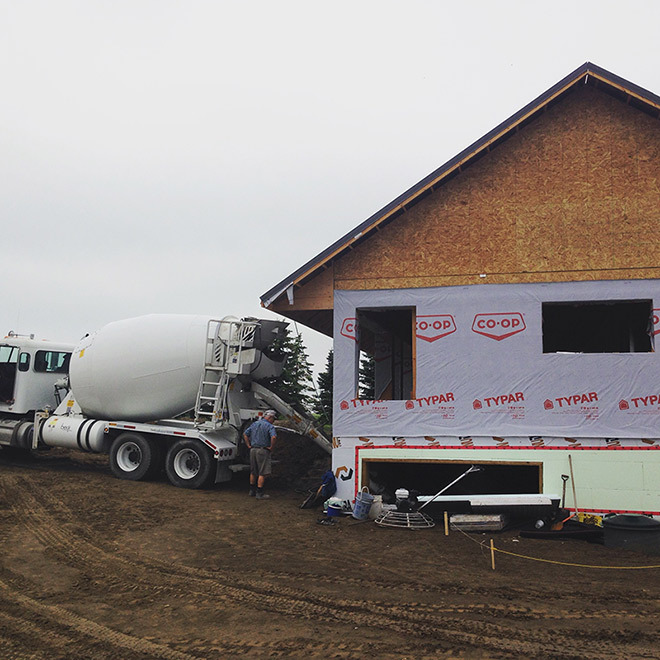 He could also do the septic system for us – two days tops, he said (I’ll remind you that Mr. A-hole had projected 8 days for septic install, backfill, and dirt hauling). Like this Monday? OMG, that was exactly the day that Mr. A-hole and his crew of buffoons were supposed to have come out! What a saviour. If this worked out (and his price was reasonable) we wouldn’t lose any time on the project. And if it went as quick as he thought, well, we would gain 5 days! Could it be true?? As if it could not get any better, he had a quote to us by the next morning. Not only was it reasonable, but it was 15% lower than the original quote from Mr. A-hole (we had decided to forfeit our septic deposit, grudgingly [although legally, as we discussed with our lawyer we did not have to when we told him that “his services were no longer required.”] – we worried about him battling us legally over it or just making our lives miserable. It was not worth our stress so we decided to forfeit it and move on. But having the slightly lower quote balanced out this loss). By Monday at 8am they were ready to go. That day felt terribly long. All I wanted to do was to get home and see what they had done, how it looked and to hopefully alleviate my concerns of spacing. And wouldn’t you believe it, by 4pm they were done! 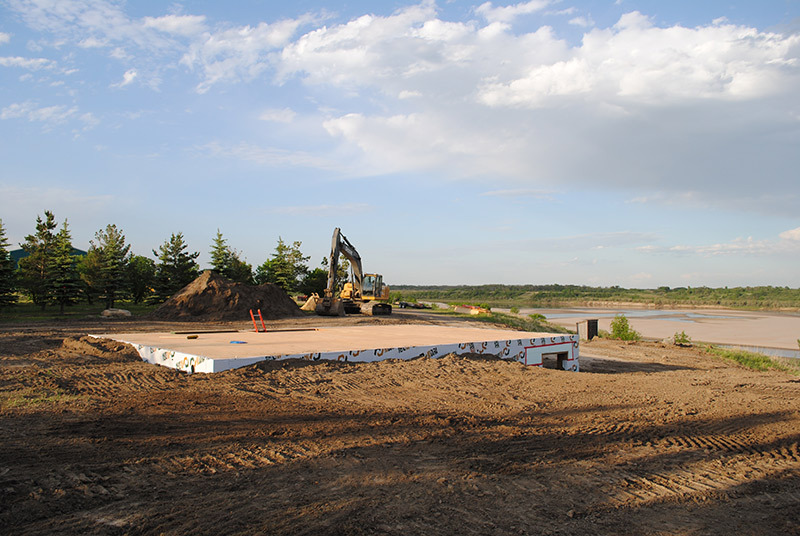 All of the dirt moved, a berm created along the driveway, the basement was backfilled and the site graded. I have never been so excited to see a flat piece of dirt before.